روابط ایران و فرانسه یکی روابط بین‌المللی بین فرانسه و ایران است. ایران به‌طور کلی از قرون وسطی یک رابطه دوستانه با فرانسه داشته‌است. این رابطه تا دوران ریاست ژاک شیراک همچنان دوستانه بود ولی در سال‌های اخیر این رابطه به علت ارجاع دادن توقف غنی‌سازی اورانیوم شورای امنیت سازمان ملل متحد و حمایت فرانسه به خوبی گذشته نبوده‌است. با انتخاب حسن روحانی به عنوان رئیس دولت یازدهم ایران، وزارت امور خارجه فرانسه همراه با وزارت‌خانه‌های امور خارجه اغلب کشورهای اروپایی، ضمن تبریک این پیروزی، ابراز امیدواری جهت بهبود روابط با ایران را مطرح کردند. روز بعد از مراسم تحلیف حسن روحانی، وزیر امور خارجه فرانسه در دیدار سفیر ایران در پاریس، ضمن ابراز خرسندی از ریاست‌جمهوری حسن روحانی، ابراز داشت همان‌طور که مردم ایران خواستار تغییر در سیاست‌های خارجی ایران هستند، فرانسه نیز امیدوار است ایران در زمینه برنامه هسته‌ای ایران، جنگ داخلی سوریه و حقوق بشر در ایران اقدامات عینی انجام دهد. در حاشیه شصت و هشتمین نشست مجمع عمومی سازمان ملل متحد که در مهر ۱۳۹۲ در نیویورک برگزار شد، حسن روحانی و فرانسوا اولاند، دیدار رودررویی با یکدیگر برگزار کردند. این نخستین دیدار مقامات عالی‌رتبه دو کشور از سال ۲۰۰۵ تا این تاریخ بود. ۶۸ روز بعد از توافق هسته‌ای ژنو، بزرگترین هیئت اقتصادی خارجی بعد از انقلاب اسلامی ایران که متشکل از کارفرمایان و فعالان اقتصادی بخش خصوصی فرانسه در زمینه‌های صنعت نفت، خودروسازی، انرژی، پزشکی و … بود، در روز ۱۴ بهمن ۱۳۹۲ وارد ایران شد. این هیئت متشکل از ۱۴۰ نفر بود که هرکدام نماینده یکی از شرکت‌های فرانسوی در زمینه‌های مختلف صنعتی و تجاری بودند. این هیئت هدف خود را مذاکره در مورد راه‌های گسترش همکاری با ایران در زمینه‌های مختلف تجاری و صنعتی دانست. این هیئت دیدارهایی با محمد نهاوندیان، علی طیب‌نیا و اعضای اتاق بازرگانی ایران داشت. لوران فابیوس وزیر خارجه فرانسه در روز ۷ مرداد ۱۳۹۴ وارد تهران شد. سفر او در راس یک هیئت بلندپایه سیاسی به دعوت همتای ایرانی او محمد جواد ظریف صورت گرفت. فابیوس در این سفر یک روزه با حسن روحانی رئیس‌جمهور، محمدجواد ظریف وزیر امور خارجه، محمدرضا نعمت‌زاده وزیر صنعت معدن و تجارت و معصومه ابتکار رئیس سازمان محیط زیست دیدار و گفتگو کرد. فرانسوا اولاند رئیس‌جمهور فرانسه از حسن روحانی برای سفر به این کشور در آبان ماه ۱۳۹۴ دعوت به عمل آورد. رئیس‌جمهور ایران در ۷ بهمن ۱۳۹۴، عازم پاریس گردید و مورد استقبال فرانسوا اولاند، رئیس‌جمهور فرانسه قرار گرفت و همچنین با رؤسای شرکت نفت و گاز فرانسه، توتال و شرکت هواپیماسازی اروپایی، ایرباس، دیدار نموده و قراردادهایی بین ایران و شرکت‌های مذکور در جهت تبادل نفت و گاز و خرید هواپیما منعقد گردید. ↑ «استقبال رسمی رئیس جمهوری فرانسه از دکتر روحانی». وبسایت ریاست جمهوری، ۱۳۹۴/۱۱/۷. ↑ «رئیس جمهوری رؤسای شرکت‌های توتال و ایرباس فرانسه را به حضور پذیرفت». وبسایت ریاست جمهوری، ۱۳۹۴/۱۱/۸. مشارکت‌کنندگان ویکی‌پدیا. «Relations entre la France et l'Iran». در دانشنامهٔ ویکی‌پدیای فرانسوی، بازبینی‌شده در ۲۷ اکتبر ۲۰۱۱. مجموعه‌ای از گفتاوردهای مربوط به روابط ایران و فرانسه در ویکی‌گفتاورد موجود است. French–Iranian relations are the international relations between France and Iran. Iran has generally enjoyed a friendly relationship with France since the Middle Ages. The travels of Jean-Baptiste Tavernier are particularly well known to Safavid Persia. France has an embassy in Tehran and Iran has an embassy in Paris. Recently however, relations have soured over Iran's refusal to halt uranium enrichment and France supporting the referral of Iran to the United Nations Security Council. Persian ambassador Hossein Ali Beg. The Persians sent embassies to Europe as early as 1599, but avoided France, an ally of the Ottoman Empire. In the 16th and 17th centuries, Persia tried to obtain support among European nations against the expansionism of the Portuguese and the neighbouring Ottoman Empire. Since France was tied into an Ottoman alliance, however, the Persian embassy to Europe of 1599–1602 and the Persian embassy to Europe of 1609–1615 avoided France. A Capuchin mission was however established in Ispahan under Pacifique de Provins in 1627. Another French trader Jean Chardin (1643–1715) visited Persia and received the patronage of the Safavid monarch Shah Abbas II and his son Shah Suleiman I. Chardin returned to France in 1670. The following year, he published an account of Le Couronnement de Soleïmaan (English translation: The Coronation of Shah Soleiman). He again visited Persia between 1673 and 1680. Numerous trade contacts continued to occur between Persia (modern Iran) and France. In 1705, Louis XIV dispatched an Ambassador Extraordinary in the person of Jean-Baptiste Fabre, accompanied by a party including Jacques Rousseau, uncle of Jean-Jacques Rousseau, and a woman named Marie Petit, who owned a gaming house, probably also a brother, in Paris. Fabre died in Persia, but negotiations were taken over by Pierre-Victor Michel, leading to a largely ineffective signed in September 1708. Prior to that he had to sideline Marie Petit who, "in the name of the Princesses of France", tried to persuade the shah to recognize her as France's sole legitimate representative. Wishing to reinforce exchanges, the Shah sent an embassy in 1715, led by Mohammad Reza Beg, the Persian embassy to Louis XIV. The embassy visited king Louis XIV and obtained a new treaty of alliance signed in Versailles on 13 August 1715. Contact was then interrupted with the fall of the Safavid Empire in 1722 and the subsequent troubles, until the end of the century. 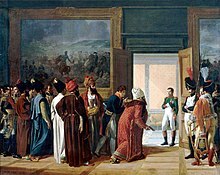 The Persian Envoy Mirza Mohammed Reza-Qazvini meeting with Napoleon I at the Finkenstein castle, 27 Avril 1807, by François Mulard. Persian ambassador Askar Khan Afshar, in Paris from July 1808 to April 1810, by Madame Vavin. A Franco-Persian alliance was formed for a short period between the French Empire of Napoleon I and the Persian Empire of Fath Ali Shah against Russia and Great Britain between 1807 and 1809. The alliance was part of Napoleon's plan to create another front on Russia's southern borders, as Iran and Russia were directly bordering each other there in the Caucasus region. Furthermore, the Iranian king was involved in a territorial dispute with the Russian tsar following its annexation of Georgia, which had been intermittently part of Iran since the mid 16th century. The alliance unravelled when France finally allied with Russia and turned its focus to European campaigns, and dropped its support during the Russo-Persian War (1804-1813), which eventually turned out into an Iranian defeat and huge irrevocable territorial losses, comprising modern-day Georgia, Dagestan, and most of the contemporary Republic of Azerbaijan. Following the 1979 Islamic Revolution, France refused to continue to provide Iran with enriched uranium, which it needed for its nuclear program. Tehran also did not get its investment back from the Eurodif joint stock company formed in 1973 by France, Belgium, Spain and Sweden. In 1975 Sweden’s 10% share in Eurodif went to Iran as a result of an arrangement[clarification needed] between France and Iran. The French government subsidiary company Cogéma and Tehran established the Sofidif (Société Franco–iranienne pour l’enrichissement de l’uranium par diffusion gazeuse) firm with 60% and 40% shares, respectively. In turn, Sofidif acquired a 25% share in EURODIF, which gave Iran its 10% share of Eurodif. Reza Shah Pahlavi lent 1 billion dollars (and another 180 million dollars in 1977) for the construction of the Eurodif factory, to have the right of buying 10% of the production of the site. In 1982, president François Mitterrand, who had been elected the year before, refused to give any uranium to Iran, which also claimed the $1 billion debt. In 1986, Eurodif manager Georges Besse was assassinated; the act was allegedly claimed by left-wing militants from Action Directe. However, they denied any responsibility during their trial. In their investigation La République atomique, France-Iran le pacte nucléaire, David Carr-Brown and Dominique Lorentz pointed to the Iranian intelligence services' responsibility. They also claimed that the French hostage scandal was connected to the Iranian blackmail. Finally an agreement was reached in 1991: France refunded more than 1.6 billion dollars. Iran remained shareholder of Eurodif via Sofidif, a Franco-Iranian consortium shareholder to 25% of Eurodif. However, Iran refrained from asking for the produced uranium. Furthermore, with the United States and other countries, France supported Saddam Hussein in the war against Iran (1980–1988). Saddam's airforce included dozens of Dassault Mirage F1s, Dassault-Breguet Super Étendards, and Aérospatiale Gazelles, among other weaponry. Iraqi military purchases from France totaled $5.5 Billion in 1985, prompting U.S. Senator Ted Stevens of Alaska, and chairman of the U.S. Senate Appropriations Committee, to declare France's selling of military equipment to Iraq as "international treason". In fact it was Jacques Chirac who helped sell Saddam the two nuclear reactors that started Baghdad on the path to nuclear weapons capability. By 2000, France had become Iraq's largest supplier of military and dual-use equipment, according to a senior member of Congress who reportedly declined to be identified. In June 2003 French police raided the People's Mujahedin (PMOI)'s properties, including its base in Auvers-sur-Oise, under the orders of anti-terrorist magistrate Jean-Louis Bruguière, after suspicions that it was trying to shift its base of operations there. 160 suspected MEK members were then arrested, 40 went into a hunger strike to protest against the repression, and ten immolated themselves in various European capitals in protestation against the raids. French Interior Minister Nicolas Sarkozy (UMP) declared that the MEK "recently wanted to make France its support base, notably after the intervention in Iraq," while Pierre de Bousquet de Florian, head of the DST, France's domestic intelligence service, claimed that the group was "transforming its Val d'Oise centre [near Paris] ... into an international terrorist base". US Senator Sam Brownback, Republican of Kansas and chairman of the Foreign Relations subcommittee on South Asia, then accused the French of doing "the Iranian government's dirty work". Along with other congressmen, he wrote a letter of protest to President Jacques Chirac, while longtime OMPI supporters such as Sheila Jackson-Lee, Democrat of Texas, criticized Maryam Radjavi's arrest. With 6.25% of the market share in exports to Iran, France was Iran’s sixth-leading supplier in 2005. Iran is France’s 27th customer (its third-leading customer in the Middle East). Fifty-five percent of French exports are concentrated in the automotive sector. French companies are also very active in the oil industry, rail and shipping transport, and the financial sector. For the most part, imports from Iran are crude oil. Altogether, 3% of French hydrocarbon imports come from Iran. A reciprocal agreement protecting and encouraging investment signed by the French Minister Delegate for Foreign Trade on 12 May 2003 in Tehran came into force on 13 November 2004. Iran’s Minister of Commerce, Mr. Mohammad Shariat-Madari, made an official visit to France from 20 through 23 January 2004. The French Secretary of State for Transport and the Sea, Mr. François Goulard, went to Iran on 20 June 2004, on the occasion of the resumption of Air France’s Paris-Tehran flights. The nuclear issue will determine any changes in the business climate in Iran. France and its European partners have emphasized to Iran the promising prospects that would result from a negotiated solution. However, the present worsening of the nuclear crisis could damage France's economic cooperation with Iran in the long run. The declarations made by the Iranian President promoting the destruction of Israel and negating the Nazi genocide have been strongly condemned by the French President. Iran’s ambassador was summoned to the Ministry of Foreign Affairs on 27 October 2005 regarding this matter. The French government has expressed its concerns to the Iranian government about the human rights situation in Iran. On 12 December 2005, the Prime Minister awarded the French Human Rights Prize to the wife of Emadeddin Baqi, an Iranian dissident who fights for prisoners’ rights and against the death penalty in Iran. In the context of its policy supporting defenders of human rights, the Ministry of Foreign Affairs summoned the Iranian chargé d'affaires to Paris in August 2005 to express its concerns regarding the fate of journalist, Akbar Gandji, and his lawyer, Mr. Soltani (who was awarded the French Human Rights Prize in December 2003 on behalf of the Human Rights Defence Centre, of which Ms. Shirin Ebadi, Nobel Peace Prize Laureate, is the President). Iran’s ambassador in Paris, Mr. Sadegh Kharazi, ceased to hold office on 22 November 2005. His successor Ali Ahani is currently the new ambassador under President Ahmadinejad and thereafter. The Franco-Iranian relation has cooled off in recent years. Some leaders of MKO were admitted to France and they have actively campaigned against the Islamic regime. Since election of President Ahmadinejad in 2005, the relation has become more contentious. In January 2007, Jacques Chirac warned in an interview that "if Iran were to launch a nuclear weapon against a country like Israel, it would lead to the immediate destruction of Tehran", but he quickly retracted his comments. In 2009 Ahmadinejad's re-election, France supported the opposition candidates, who lost the election. The Iranian movie maker Mohsen Makhmalbaf resided in France during the run-off to the elections in 2009 and was spreading anti-government propaganda and promoting the Green velvet revolution. Also, Iran accused the French embassy for having a role in instigating post election protest via its embassy personnel in Tehran. In late August 2010, Iran's state-run daily paper Kayhan called France's first lady Carla Bruni-Sarkozy a 'prostitute' after she had condemned the stoning sentence against Sakineh Mohammadi Ashtiani for adultery in an open letter, along with several French celebrities. The paper later also called for Bruni to be put to death for supporting Sakineh Ashtiani, and for what the paper described as Bruni's moral corruption and having had extra-marital affairs herself. Even though Kayhan is a state-sponsored paper and it continued its tirade against Bruni along with other state-run Iranian media, Iranian officials tried to distance themselves from that violent stance, while a spokesman for the French Foreign Ministry criticized the comments as being 'unacceptable'. The incident rapidly found its way into the Iranian domestic politics. On 10 April 2019, Iran’s president, Hassan Rouhani, in a telephone conversation with French President Emmanuel Macron, described putting Iran’s Islamic Revolutionary Guards Corps, IRGC, in the US Foreign Terrorist Organizations as very provocative. According to a 2012 BBC World Service poll, only 7% of French people view Iran's influence positively, with 82% expressing a negative view. According to a 2012 Pew Global Attitudes Survey, 14% of French people viewed Iran favorably, compared to 86% which viewed it unfavorably; 96% of French people oppose Iranian acquisition of nuclear weapons and 74% approve of "tougher sanctions" on Iran, while 51% support use of military force to prevent Iran from developing nuclear weapons. France's imports from Iran in the first nine months of 2016 show a 34-fold rise compared to the corresponding period in 2015, Iran's state-run Tasnim News Agency reported on 10 December 2016. ^ Lauzon, Matthew (2014). ""In the Name of the Princesses of France": Marie Petit and the 1706 French Diplomatic Mission to Safavid Iran". Journal of World History. 25 (2–3): 341–371. doi:10.1353/jwh.2014.0019. ^ "Jean-Louis Bruguière, un juge d'exception" (in French). Voltaire Network. April 29, 2004. ^ Dominique Lorentz (November 11, 2001). "La république atomique" (in French). Le Monde. Archived from the original on 2007-05-09. ^ "Iskandar Safa and the French Hostage Scandal". Middle East Intelligence Bulletin. February 2002. Archived from the original on 2006-02-14. ^ "French connection armed Saddam." Bill Gertz, The Washington Times, September 8, 2004. ^ "France investigates Iran exiles". BBC News. June 22, 2003. ^ Rubin, Elizabeth, New York Times. "The Cult of Rajavi". Retrieved 2006-04-21. ^ "Iranian newspaper says French first lady deserves to die". CNN. 2 September 2010. ^ "Tasnim News Agency - France's Import from Iran Skyrockets in 2016". Tasnim News Agency. Retrieved 2016-12-20. Amini, Iradj (2000). Napoleon and Persia: Franco-Persian relations under the First Empire. Washington, D.C.: Taylor & Francis. ISBN 0-934211-58-2. این صفحه آخرین‌بار در ‏۱ مهٔ ۲۰۱۸ ساعت ‏۲۱:۵۶ ویرایش شده‌است.